A few years ago I started educating myself on the presence of toxins in products we use every day. I learned that cosmetic companies and personal care manufacturers often use preservatives like parabens to extend a product's shelf life which made me wonder if our bodies know what to do with them once they are absorbed through the skin since they are not organic substances. I became curious. If the products I use daily can be made without these preservatives and still perform as well as their conventional counterparts, why not make the switch? I tried a lot of paraben-free and aluminum-free deodorants and, frankly, so many of them missed the mark in terms of performance. At best, they faintly masked odor and that was something I wasn't willing to accept. I kept searching and eventually found The Healthy Deodorant from Lavanila Laboratories at Sephora. This line of deodorants come in a array of vanilla-based scents like Vanilla Blackberry and Vanilla Coconut (also Fragrance Free). What's more, they are vegan, cruelty-free and free of parabens, sulfates, phthalates and aluminum. 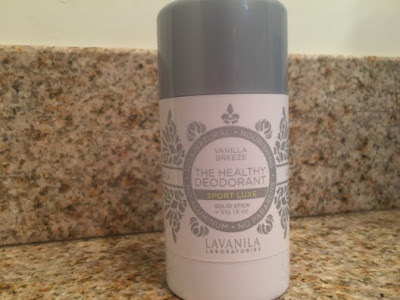 When I heard about their new Vanilla Breeze Sport Luxe Formula I had to try it. I picked it up at Sephora and gave it a go. My expectations were simple: A clean fresh scent and all and all day odor protection. Check and check. It held its own pretty well after a long, stressful day of work and again during a rigorous workout (separate applications). I have been using Vanilla Lavender for years now but I see myself replacing it with Vanilla Breeze simply because I figure you can never have too much odor protection. I'm hoping Lavanila Laboratories releases other scents in the Sport Luxe line. I'm a fan! Thanks for sharing! I've been on a hunt to get a natural deodorant. This is a really good one. They have a limited edition Vanilla Amber scent that is sold as a trio at Sephora. Really want to try that one!